The Tax Cuts and Jobs Act passed through both the Senate and the House and awaits President Donald Trump’s signature. The bill lowers the federal corporate tax rate to 21% from 35% and allows a one-time repatriation of overseas cash. Sixty-five per cent of companies responding to a Bank of America Merrill Lynch survey say they would use at least some of the repatriated cash to pay down debt. The Tax Cuts and Jobs Act has passed through both chambers of Congress and awaits President Donald Trump’s signature. And while the bill would lower taxes for the lion’s share of Americans, it would also provide benefits to America’s biggest companies. The measure would slash the federal corporate tax rate from 35% to 21% and allow a one-time repatriation of overseas cash. That’s a big deal considering that Goldman Sachs estimates S&P 500 companies hold $US920 billion of untaxed cash overseas. US companies as a whole have $US2.5 trillion stashed overseas, according to Citigroup. So what will the biggest companies in America do with all that money they will most likely be able to bring back to the US? In 2004, when a so-called tax holiday most recently occurred, roughly 80% of the cash brought back into the US went to fund stock buybacks. But this time around would most likely be different, according to a Bank of America Merrill Lynch survey of 302 US companies. 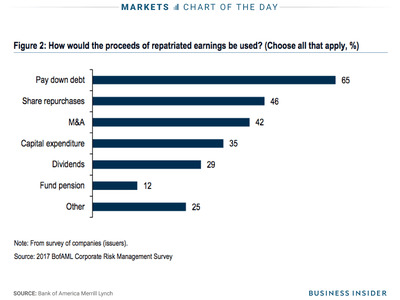 When asked how they would use the proceeds of repatriated earnings, 65% of respondents said they would pay down debt. 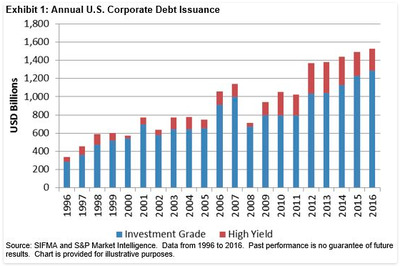 US corporate debt issuance has risen every year but one since the financial crisis, and it is on pace for a record year in 2017. “The only reason why a lot of these companies issued so much debt was that they could not touch the overseas cash – when they now gain access to this cash, it makes sense to use some of it to take out the debt,” Bank of America Merrill Lynch wrote in a recent note. With the Federal Reserve expecting three more interest-rate hikes in 2018, paying down debt could save companies exposed to floating interest rates billions of dollars in interest expenses over the next few years. At the same time, corporate America still has plans to use the cash to buy back shares. 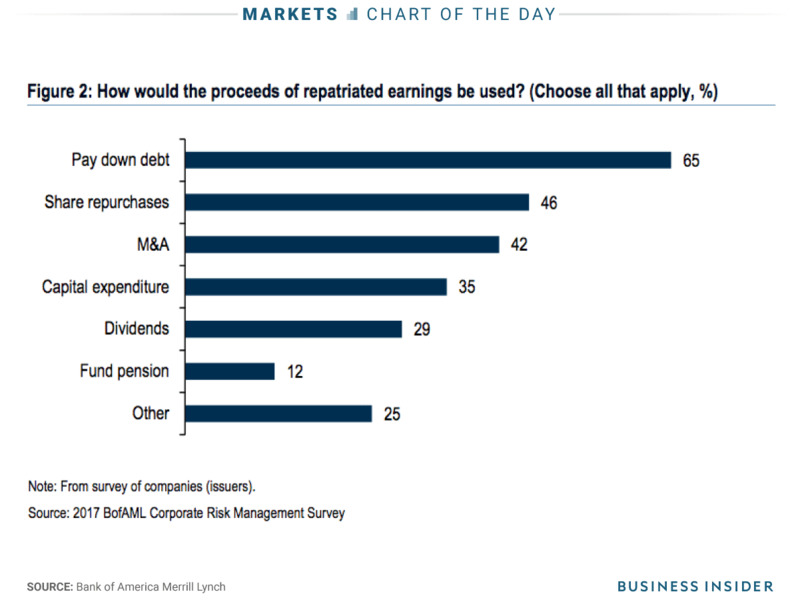 Just less than half of the respondents, 46%, said at least a portion of the repatriated money would be spent on buybacks, which are a good way to achieve immediate share appreciation and signal to investors that a company views its stock as undervalued. Even less responded saying they would spend the money on mergers and acquisitions (42%) and capital expenditures (35%).